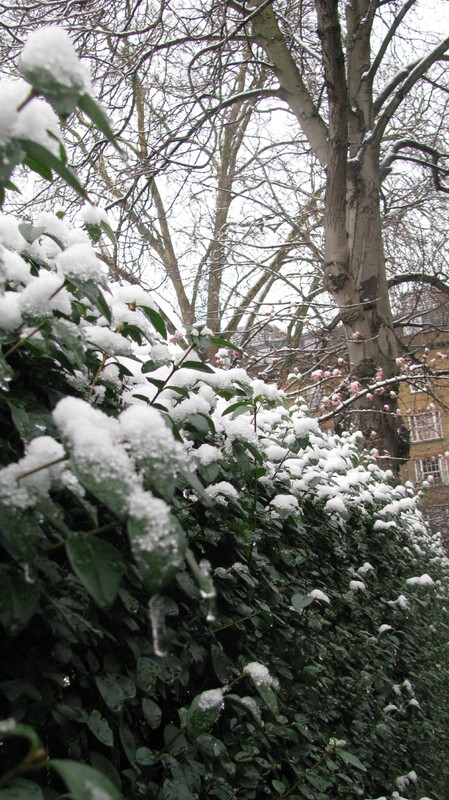 ← It’s snowing again in London! Last night we received a light dusting of snow in London. This morning, the sidewalks and streets were wet, but no snow. 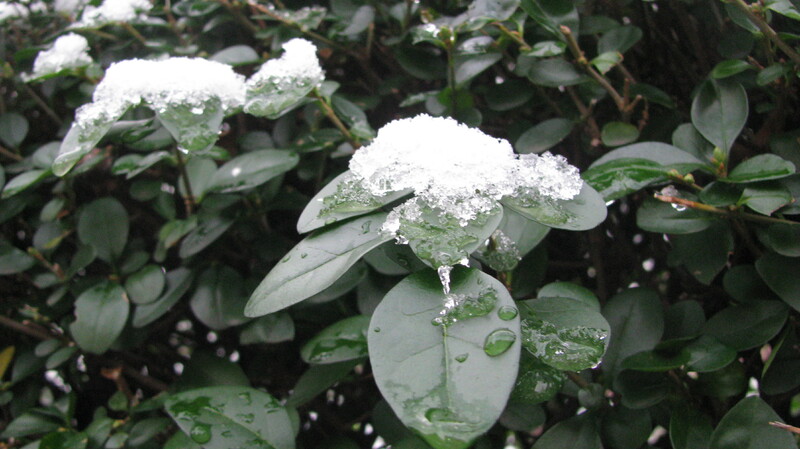 The trees and bushes have some snow on them, but I don’t think it will last long. When I took my dog for his morning walk I snapped a few photos. 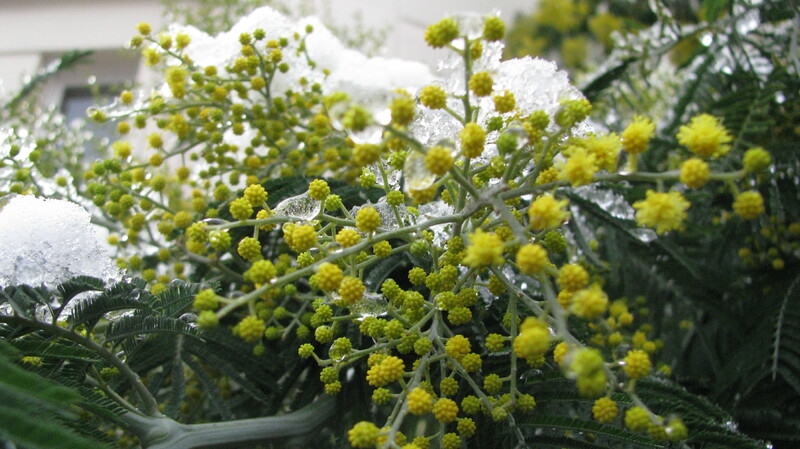 I was sad that the mimosa that I discovered earlier this week had snow on it. I hope this doesn’t stop it from blooming. The yellow flowers are beautiful. This entry was posted in London and tagged Dogs, England, London, Mimosa Tree, Mimosas, Morning Walks, Snow, Walking Dogs. Bookmark the permalink. It is a wonderful way to start the day! 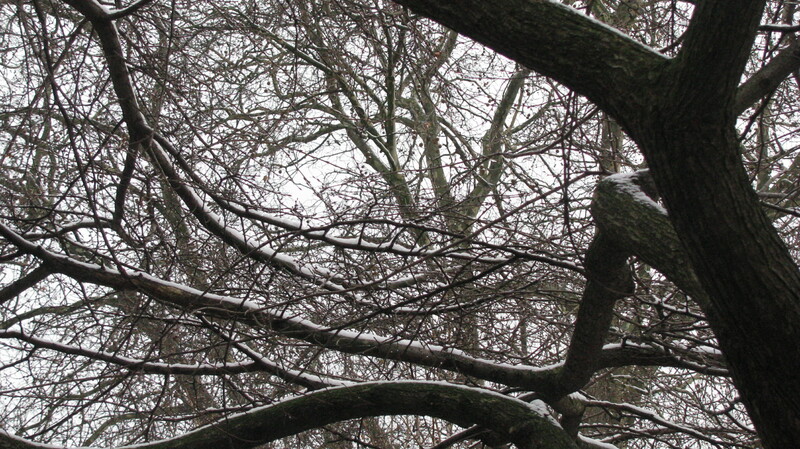 Perfect snow…..pretty, but not long lasting! I know. It goes away before it gets gross! The sad thing is that blossoms can be killed by sudden cold. Here we had a few bushes with tentative buds because it was too warm for a while. I’m afraid they will not make it. I like the first two photos a lot. I hope it doesn’t happen to this one, but I was worried when I saw it blooming this early. We are bound to have more cold days before spring. It would be a shame. I hope your bushes survive as well. The mimosa does make me sad. I just found the tree and now I’m afraid it won’t make it. But maybe it is stronger than I think. Have a great weekend! Waw, love the melting snow on the leafs. Perfect way to start your day! It does help wake you up and appreciate life! So that was a mimosa, huh? Beautiful—even with the snow on it!!! Hope it stays beautiful long after the snow is gone!!! Me too! 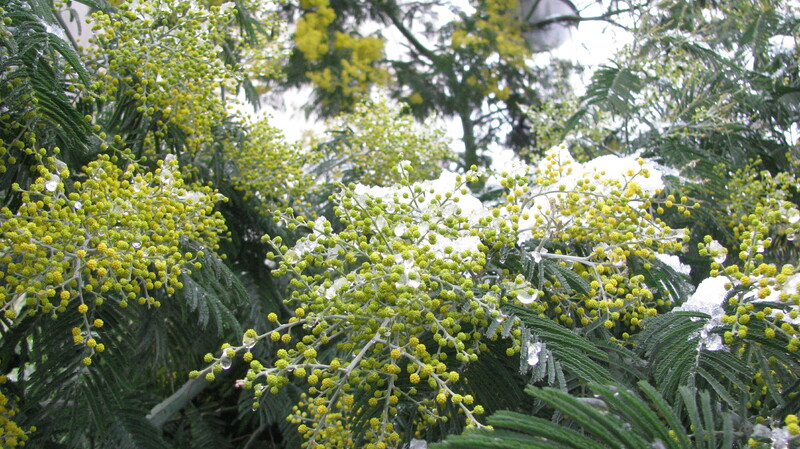 I love this mimosa–such beautiful yellow flowers. So lovely! Have never seen mimosa before. This is the first one that I’ve seen. Ah…that is the best part and worst part about leaving home. So many memories that makes us happy and also a little sad as well. These are nice photos! Yes, a fresh dusting of snow can make things look beautiful! It is amazing how snow can change things! The yellow in the mimosa is just beautiful. I hope the snow gives them life rather than take it away. I hope you are right…unfortunately we had freezing rain last night. I haven’t had the heart to go look at them today. I actually like that. My favorite snow is freshly fallen snow. It gets too dirty and gross after a couple of days. LOL…very good point! Snow is always so beautiful when you remember it in your head.